When you have the right strategy, nothing is out of your reach–it will help you lose the pounds for good, create the relationship of your dreams or take your career to the next level. What are you currently doing? Let’s take the goal of losing weight for example. What are you currently doing to get to your goal weight? Maybe you plan to go to the gym four times a week, but something always gets in the way. Your healthy eating plan is constantly getting derailed by your co-workers asking you to go out to eat lunch with them at unhealthy restaurants. Write down everything you plan to do and then what you are actually doing in regards to your goal. This is the first step toward creating the right strategy for goal achievement. Is what you are doing now getting you to your goals? Now take an honest look at what you’re doing and see if it’s getting you any closer to your goals. Are you hoping to lose a pound a week but are currently not? Do you lose a pound a week when you consistently go to the gym four times a week and avoid lunches out? If what you’re doing on a regular basis is not getting you closer to your goals, you need to change what you’re doing and devise a strategy that will be effective. What isn’t working? If you know that what you’re currently doing isn’t getting you where you want to be, it’s time to make changes. In the above scenario, what isn’t working is that you are not going to the gym like you planned and your co-workers’ invitations are getting you off track. These are the two areas that need to be changed in order to achieve your goal of losing a pound a week. Once you understand what needs to change, you can begin to determine the steps that will take you from where you are to where you want to be. This will help you devise a strategy that is resistant to distractions while also strengthening your time management goals via holding yourself accountable toward making the time for things that will keep you on track, like meal prepping or using your lunchtime and breaks for physical activity. Being able to constantly aim for the next level is a mindset mastered by champions. You don’t have to be born a champion to live your daily life with this mindset. Learning to rewire your brain for the focus, clarity and determination of a champion will allow you to break through and take your life to the next level. Learning how to develop a strategy is just one tool in your arsenal. Download the report below to learn more about the Champion’s Mindset and how you can approach life at this peak level. 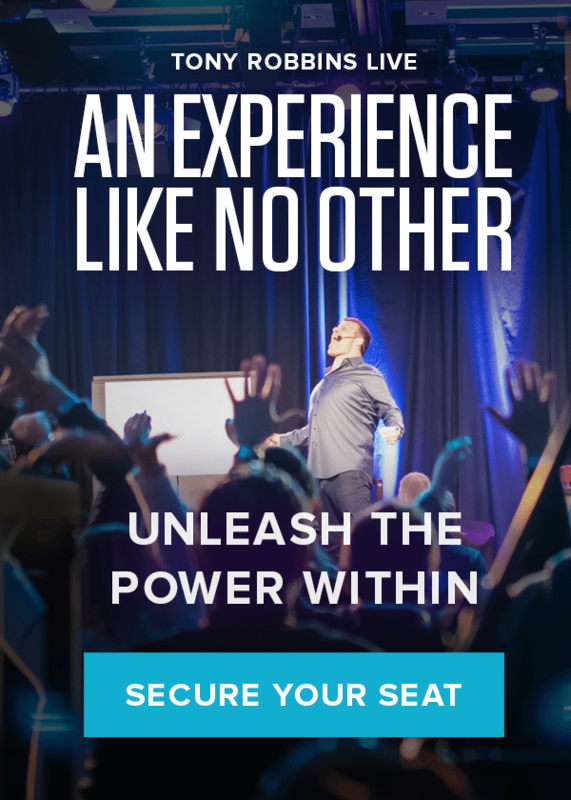 If you’re ready to start living the life of your dreams, attend Unleash the Power Within. Tony Robbins will empower you to take charge of your life and develop the self-confidence necessary to achieve your personal and professional goals to create the life you desire.